Soapstone wood stoves are an effective and straightforward way to achieve the benefits of thermal mass heat storage without sacrificing the efficiency and simplicity of standard metal wood stoves. Soapstone is an attractive finish used in some stove designs. It is also functional, adding substantial thermal mass to a stove. A stove with high thermal mass gives steadier heat over extended periods of time. Soapstone is a naturally occurring metamorphic stone, formed under intense heat and pressure deep within the earth. Soapstone is capable of withstanding dramatic extremes of heat and cold which has made it a sought after material throughout human history. Other stones such as marble and granite can store and release heat but cannot withstand the high intensity of direct flames. Soapstone has been revered for its beautiful characteristics; Egyptians and Assyrians carved sculptures from it, the Norwegians used it to build Cathedrals in the 11th and 12th Centuries. Eskimos used soapstone slabs to cook directly (the original non-stick pan!) and it has been quarried in more recent history to provide stones for bed warmers, cooking griddles and sinks. 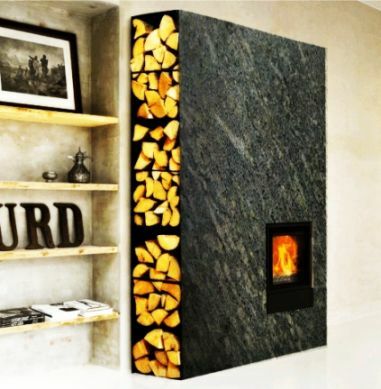 Using soapstone within wood stoves is a particularly attractive proposition - it stores more energy for its mass than any other naturally occuring material (twice that of iron) and suffers minimal expansion and contraction when heated. The soapstone components then radiate gentle, comfortable heat back into the room for hours after the fire is extinguished. This substantial soapstone fireplace is an impressive feature in a large room, and yet also a highly functional thermal mass store. Unfortunately for most of us such grand designs will be out of reach either financially or practically or both. More affordable and practical alternatives are available which fit more easily into the traditional home setting. These smaller versions look very similar to the modern fireboxes which most people will be used to. 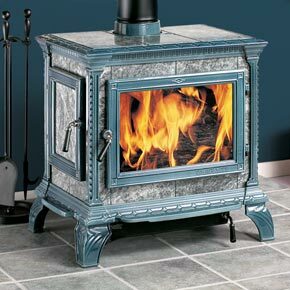 They normally consist of an efficient central woodstove with more or less substantial soapstone panels. These combine the maximum efficiency in combustion with good thermal storage properties. They can continue to provide heat into a room a few hours after the main fire has been extinguished. This is a significant improvement on fireplaces without the inserts however they do not usually have sufficient mass to maintain heat for longer periods of time. As discussed above, soapstone offers a many opportunities for visually appealing, and even exciting, home heating solutions. Soapstone is expensive, more so than other stoves with high thermal mass - consider getting a larger masonry stove instead. Soapstone provides even radiant heat long after the original fire is out. The fire needs loading less often and provides warmth to the building right through the night. Greater mass of soapstone will maintain warmth for longer. The more stone you can include the more evenly the heat will be distributed. Your choice of stove will depend on your house circumstances (existing chimney, size of hearth, wood stove purpose). Soapstone itself is a highly attractive material and relatively uncommon in modern fireplace construction.